I've often thought of how miraculous evolution really is, how amazing it is to find such infinitely complex structures that have been derived from billions of years of natural selection, how all of these "perfect" structures somehow or other originated from a single celled ancestor. Take, for instance, the human eye. Human eyes, and in fact most vertebrate eyes, are pretty incredible don't you think? We can see a broad range of colours, we have an acute sense of depth perception, and in fact primates are believed to have lost much of their sense of smell and hearing due to an increased reliance on our keen eyesight. Our eyes seem perfectly evolved to give us full colour, clear and true vision. I was intrigued when I picked up a recent issue of New Scientist that in their article, Evolution's Greatest Mistakes, Claire Ainsworth and Michael Le Page argue that the halls of human evolution are actually full of bloopers, and big "mistakes". Surprisingly, a good case of an evolutionary "oops" is the vertebrate eye. 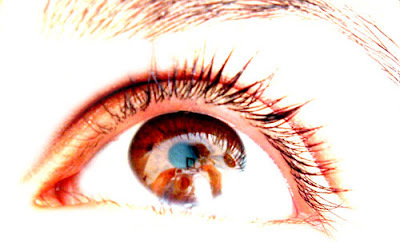 Contratry to my initial thoughts, our eyesight is actually quite far from perfect. According to Ainsworth and Le Page, "vertebrate eyes" have a huge flaw: "the retina, is wired up back-to-front, with the light-sensitive cells behind the nerves and blood vessels that support it". Apparently this distorts our vision and causes a substantial "blind spot in each eye". Although there is a small spot in the center of the retina that is not obstructed by these blood vessels, called the fovea, we still only have a small dot of full colour, detailed, in focus vision and a large out-of-focus periphery. Graham Lawton explores the concept of the imperfect eye in his article, Mind Tricks. Far from my assumption of clear and true vision, he calls our vision merely "sporadic input". Lawton reveals that what we see as a "seamless visual experience" is noneother than the patchwork collage of "fixations", or short bursts of vision, which are gathered in between the small darting movements of our eyes "called saccades". Apparently each time we move our eyes they cease to pick up visual information for that fraction of a second. Since we flick our eyes on average three times each second there is a lot we are not picking up. Most of us will never be able to see this blind spot, because it happens so quickly that we do not "see" it. However, if you want to test this theory Lawton suggests that you watch "your eyes close-up in the mirror and flick your focus back and forth from one pupil to another. However hard you try you cannot see your eyes move - even though somebody watching you can." The worst of it is that while your visual cortex isn't looking your brain is filling in the gaps with what it thinks you should be seeing. This likely explains why when the police interrogate five different eye witnesses, they tend to get five very different stories of what was or was not seen. So the question is why on earth would natural selection favour misassembled retinas, a mere peekhole of clear vision, and a line of sight that clocks off three times per second? The truth is probably that although the structure of the eye is not as perfect as it could be it is pretty useful at fulfilling it's evolutionary purpose: proliferation of the species by allowing us to quickly identify food and danger which in turn enables us to survive long enough to reproduce. Ainsworth, C., & Le Page, M. (2007, August 11). Evolution's Greatest Mistakes. New Scientist, 36 - 39. Lawton, G. (2007, September 22). Mind Tricks: Six ways to explore your brain. New Scientist, 35 - 41. Just wanted to share a funny remark that caught my attention: you mention that it is incredible that our eyes see in "full color". But what is full color? The entire eloctromagnetic spectrum? No - not quite. "Full color" stands for... the colors that the human eye can see. I'm still happy to have eyes, but would appreciate an upgrade as well. I agree with Igor. But really this imperfection is really nothing...we do not miss what we do not know! I do not really care if I do not have 20/20 vision (I don't), I do not care if I can not perceive full details...as long as I can see the wonderful variety of nature, the color of the eyes of my wife...but...an upgrade would be a nice thing!